You can always download the official setup package of Mind Collected from www.dextronet.com/mind-collected. The installer, mindcollected.exe, has about 14 MB. The installation does not require admin privileges. After starting the installer, you can simply click the Install button and that’s the whole installation procedure. The default installation directory is My Documents\Mind Collected, and can be changed using the Advanced button in the installer. Please choose a directory that does not require admin privileges for access. The setup and program will not function properly when installed into admin-only location (such as Program Files). The free 30-day trial is fully functional and starts when you first run Mind Collected. The free trial lasts for 30 days, and it includes at least 14 guaranteed days of actual use. Both the trial version and the full version use exactly the same installer (setup) file, so there is just a single download for both. When you purchase the full version from the official Secure Software Store on the Dextronet website, you will instantly receive your license code. You can enter it into Mind Collected by clicking the button Help, then Enter License Code. This will instantly convert your trial version into full version. All your data and settings will be fully preserved, of course. All orders are 100% risk-free and are fully protected by the 90-Day Money Back Guarantee. Simply put, when you are not amazingly happy with Mind Collected, we will promptly refund you the full amount paid with no hassles. When the free trial runs out, you can’t use the program anymore unless you purchase it. “DLL” folder – the “DLL” folder contains about 15 DLL libraries that are required to run Mind Collected. Mind Collected does not include or use any other files anywhere else on your computer, so you have total control over it. Having all the files that Mind Collected uses in a single directory makes it easier for you to completely backup Mind Collected or to transfer it to another computer. You can also simply copy the whole directory to create a portable copy (see below). Mind Collected files take about 37 MB total, plus the size of your database. Mind Collected is portable. You can just copy the Mind Collected folder to a USB drive or other computer and run it from there without any additional requirements. The 3 uninstaller files and the 2 .url files are not required by Mind Collected and can be omitted when making a portable copy. Thanks to the portability, you can use Dropbox, SkyDrive, Google Drive or other cloud-drive service to keep Mind Collected synchronized across your Windows computers. You can either simply install Mind Collected into your cloud-synced folder (e.g. into your “Dropbox” folder), or, relocate just the database file into the cloud-synced folder. If you install Mind Collected directly into your synced Dropbox folder, Dropbox will keep everything (database, settings, Mind Collected executable itself) synchronized across your Windows devices. You do NOT need to install Mind Collected on your other devices, you can simply run it from the synced folder. (You can create a desktop shortcut yourself, if desired.) Significant advantage of this approach is that you have to install Mind Collected updates just once. Tip: To choose a custom installation location in Mind Collected installer, click the “Advanced” button on the bottom. If you’ve already installed Mind Collected, you can just relocate (using the Options window) your database into the Dropbox folder. You then need to go to your other computers, install Mind Collected, and using Options, open the database file from the synced folder. Please note that Dropbox can’t download new database file versions from the cloud when Mind Collected is running, because the local file is in use. In practice, this means that you need to exit Mind Collected before switching to another computer, so when you come back, Dropbox can download the new database file before you launch Mind Collected again. To further clarify the above: Dropbox can upload updates of the database file into the cloud even when Mind Collected is running, almost in real time, with perhaps 5-30 second delay. But on all the other devices, Mind Collected needs to be closed so the updated database files can be downloaded. When syncing Mind Collected using one of these services, it is highly recommended that you disable automatic start of Mind Collected on Windows startup in Options, on all computers. If you don’t, you risk that when you start your computer, Mind Collected will launch before Dropbox had chance to download the latest database file from the cloud – that can result in a conflicted copy of the database file. Mind Collected is light-weight and doesn’t have very demanding hardware requirements. It works well on all newer Windows computers. It works great with Windows XP, Vista, 7 or 8, both 32-bit and 64-bit. Mind Collected requires Microsoft .NET framework 4.0, which is present on most computers, as it is required by many popular programs. 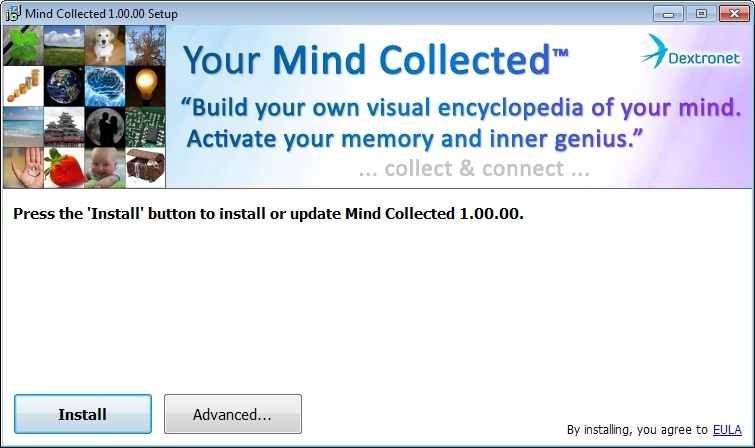 Mind Collected installer will automatically download and install the framework if it’s not present on your computer. Similarly, when started, Mind Collected itself checks if the framework is present on your system, and if not, help you to download and install it. If you are a serious power-user and plan to have thousands of entries in your collection, here are some tips for best experience. Mind Collected is fastest when installed on a SSD drive, but you can of course use any regular HDD as well. 8 GB RAM is best. Although Mind Collected doesn’t use a lot of RAM initially (about 100 MB), once you get to thousands of items stored in your database, the RAM consumption will increase (possibly to 500 MB and more), as Mind Collected caches some of the items to improve performance. You can of course use Mind Collected on computers with 4 GB RAM or less as well, without any difficulties. When it comes to HDD space, expect about 300-600 MB required for each 1000 entries in your database, depending on how large resolution of images you are going to use on average, and what JPG quality you specify in Options. Database backups take additional space. Having 10-20 GB of free space is usually plenty for a long time. Large 16:9 LCD screens with Full HD resolution (1920×1080) look great with Mind Collected. But it of course works with any sort of standard display that is capable of displaying web pages. The cutting-edge 4k displays (with enormous resolutions on small space) are not yet recommended for Mind Collected (rest assured, we are keeping an eye on them).